"I loved it!!!! I definitely want to do this again next year." 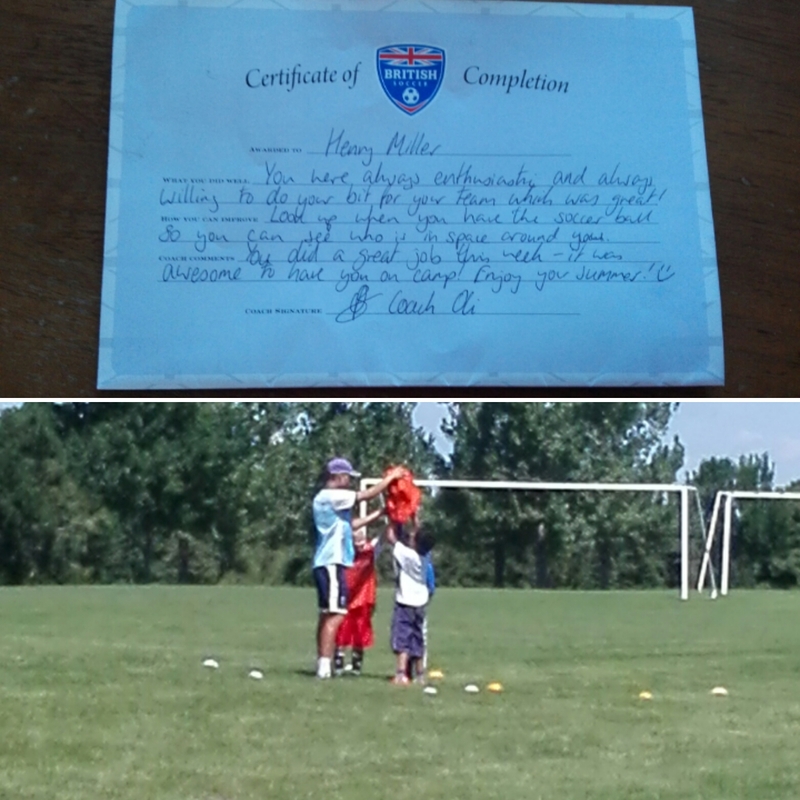 That was the quote from my son when I picked him up after the last day of soccer camp. I had the unique opportunity of allowing him to go to camp for free in exchange for providing a review on my blog. My son loves soccer. 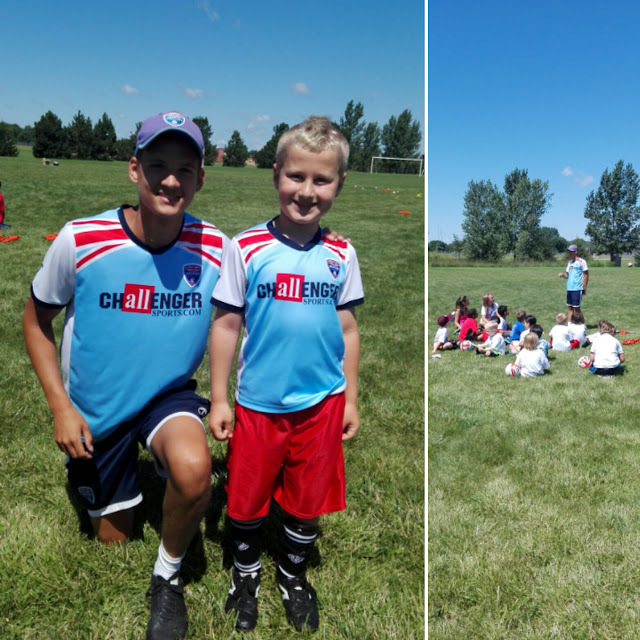 It was something he really wanted to play and he played summer and fall soccer last year in one town and then this past year he did spring soccer in a different town and then summer and will do fall soccer in the same town as last year. There is just something about soccer that he gravitates toward and when I told him I had the opportunity for him to take this camp that was half a day, 3 hours a day, he was very excited about it. 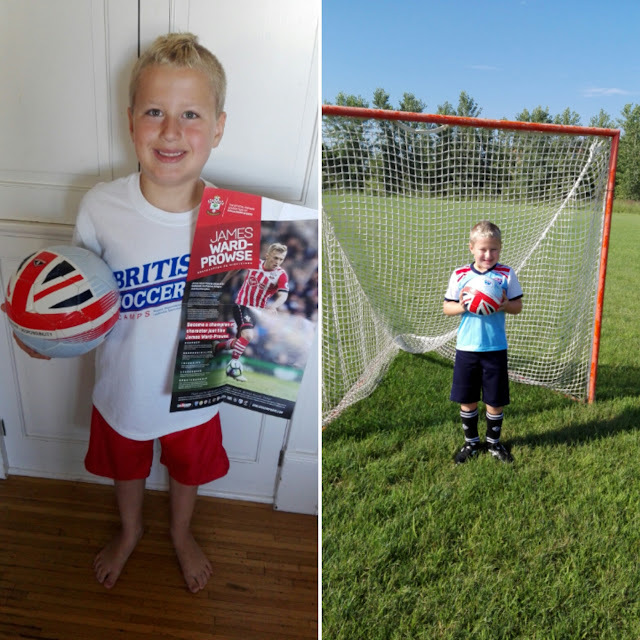 He had a week break from Summer soccer and then it was back on the field again for this British Soccer Camp in a completely different town then the two he has done soccer in before. It was a great camp for building both skills and character. The camp does lots and lots of drills of various kinds but they also play games against each other. This particular Camp had 15 participants ranging in age from 6 to 12 with most of them being six seven or eight years of age. On the first day of camp when they start playing games against each other they are split into teams. My son was on Team Brazil. Because there wasn't an even number of participants there had to be one team with only three players and the rest had four, his was that team but they didn't let themselves be defeated by having a smaller number. Coach Oli told them about the World Cup and how they would be playing for their own World Cup but they didn't earn points just on winning games they also earned it by showing good character and good sportsmanship having good Hustle and participating in the extra activities he asked them to do at home. facts to share with the group. And another day they were asked to bring or make their team country flag. These were optional activities but help them score more points for their World Cup status. It also gave them the opportunity to learn more about other parts of the world that play soccer. During this 3-hour can they had the opportunity to take multiple water breaks which was much needed on the first 3 days that was temperature in the 80s and relatively high humidity those days. Then about two hours into Camp they would take a 15 minute break to have a snack that they brought. 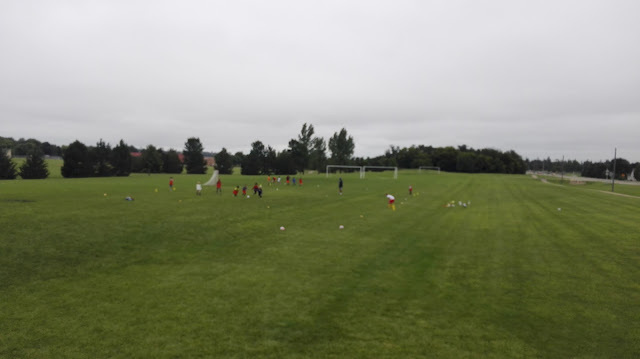 The first day of camp was a bit of chilly and drizzle weather but they still play and kids just dress appropriately for the weather. They only cancel or delay Camp is if there is lightning. The last day of camp could not have had more perfect weather with temps between 65 +72 during the duration of the camp. On the last day of camp the kids received their Camp t-shirts that are included in the fee. They also received a poster that had comments from the coach on the back side with ideas of what they can work on and what they did well at an additional General comments from the coach. On the first day of camp they received they're British soccer camp soccer ball and brought that with them to Camp every day. When you register online through Challenger sports at least 45 days in advance you have the opportunity to get a jersey for the cost of just shipping and handling which was $7.95. I did buy one for my son and he was the only child who had one but the coach had the same Jersey and so every night I had to wash that Jersey so that my son could wear to Camp so he would match his coach who he looked up to as a role model. There was the opportunity to add on a half-day goalie Camp after the morning soccer camp which I opted not to do because I thought 3 hours might already be enough for my son but after this year we have now talked about that we might pay that additional small fee to have him do the goalie camp and learn how to be a better goalie. He has been a timid goalie in the past but he gained some confidence in being a goalie during this camp and I can only imagine if he has spent more time practicing goalie skills how much he would have improved. 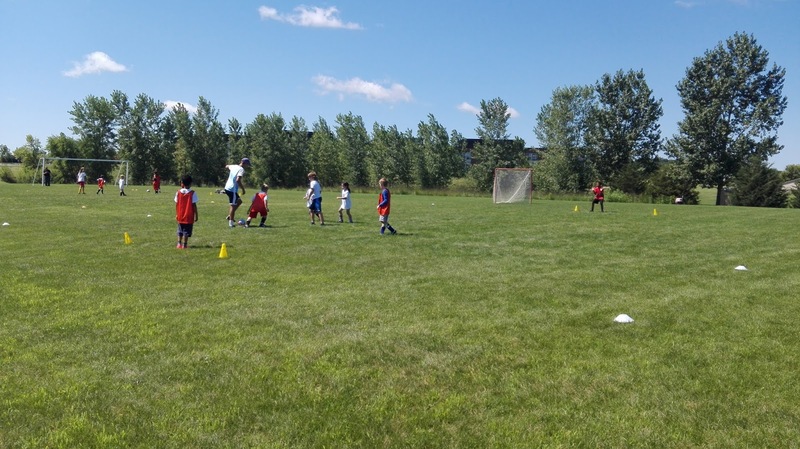 The skills of the kids at the camp ranged greatly from kids who had never really done soccer before two kids who had a fair amount of experience in soccer. Because the smaller number of kids on a team it meant they couldn't separate into offense and defense like he did during his soccer games in spring and summer. 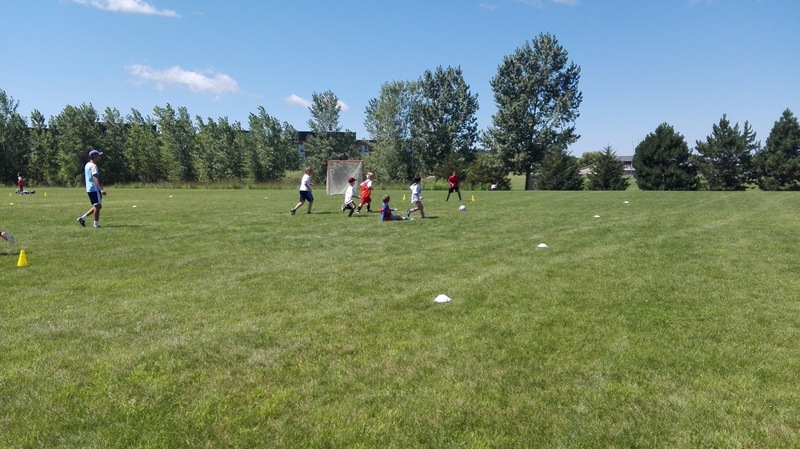 Each kid had to play both offense and defense and run the field the entire time unless they were the goalie. Since my son's team only had three people on it if he was on the field it meant he had to work very hard and had plenty of opportunity to make cool shots, which he did and he was very pleased to be experiencing what it was like to be successful on the offense. This year he had tended to gravitate towards wanting to play defense most often and does a good job at at but he gravitates towards that because he feels successful there. This Camp really made him think about the positions differently and experience them differently. And because the teams were smaller and they had to play the entire field the fields were about half the size then they would have been when he plays soccer on the school teams. I do plan to look for Challenger Sports British Soccer Camp to sign him up in the future. If you want to find out which communities are hosting them you can find it on the Challenger sports website.